Recent events in the world of government, money and banking have demonstrated an appalling ignorance by those charged with managing the nation’s money supply. The media have been no better. The economic problems are assumed to hinge around monetary issues—but nobody now seems willing to be clear what money actually is and how it is created. (d) between money creation and money circulation. Having clarified these points he was able to identify the duty and role of government with regard to money, and the legitimate business of banking. George held, as he said any five-year-old would tell us, the purpose of money is to buy things with i.e. it is a medium of exchange. Essentially the only value of money is ‘in exchange’—it need have no value ‘in use’. As money becomes the ‘most exchanged’ of all things it becomes the most common measure of ‘value in exchange’. The value of all exchangeable or traded things may thus be measured in money units. He was clear about the need to distinguish between money and wealth. Money is not wealth although it may be exchanged for wealth. Wealth is tangible, money is intangible. Whilst the true nature of money is abstract, over the ages it has taken many tangible forms e.g. shells, metals, coin, paper notes and tokens of debt etc. It is in essence, however, distinct from any and all the forms it may take. In addition to being generally accepted in exchange for goods and/or services money needs to be somewhat difficult to come by. This is because its value depends upon the difficulty associated with acquiring it. Note here it is the difficulty of acquiring money that is significant not any difficulty associated with producing it that matters. In contrast the value that attaches to an item of reproducible wealth is directly associated with the difficulty (i.e. labour) of producing the like again. Thus George asserted that the value of ordinary wealth comes from production whilst the value of money comes from obligation—the obligation, as with land, that everyone is under to use it. Some rare items of wealth e.g. an artistic masterpiece may derive its value from both production and obligation. Simple credit arises when one individual (or group) agrees to postpone collection of payment from another individual (or group) to bridge the time gap between the commencement of a productive venture and the completion of a saleable product. The most common examples are where employees give credit to their employers by agreeing to be paid in arrears and where suppliers allow for a settlement period. Such credit requires knowledge of, and confidence in, the other party, it does not generally work between strangers and the transaction is not complete since a debt remains. This may be contrasted with the situation where money is used— transactions are complete and no debt remains. Although employees and suppliers are the most common providers of credit they are not the most widely recognised as such—banks are. Banks specialise in credit and may provide it to a producer if the bank believes the debt will be redeemed from new wealth that the producer is thereby enabled to produce. In this credit becomes an alternative means of accessing real capital i.e. wealth used to produce more wealth. If money is not wealth it cannot be capital or a store of wealth. It is however commonly regarded as a store of value. Clearly where money is stored it cannot circulate or perform its primary function as a medium of exchange. Here we may see the importance of distinguishing between credit and money. Clearly credit and debt can accumulate and thus become a means by which claims on wealth may be stored. Wealth itself may also be stored (e.g. as commodities, gold, diamonds, works of art, artefacts or buildings, etc.). The mortgage provider and the pawnbroker are the two examples of money lending that most people will be aware of. Here money is lent against a lien on property. If the borrower defaults, the property (or part of it) is forfeit. For the pawnbroker or the building society the money lent will be money that is already in circulation. A mortgage from a bank however may be quite a different matter, and is the most well known example of the ‘money as debt’ system referred to earlier. Banks have a massive usurious incentive to exploit the licence they have been given to create money in this way. Such money is not created and put into circulation in response to a need to facilitate more production (including trade) but merely to enable land (which nobody produces) to be bought and sold. The more this money becomes available the higher the price of landed property and the more debt there is in society. Where the wealth must come from to fund the so-called interest payments is another story. Unlike a token of credit, where its value derives from a confidence in production, the value of money does not come from production but rather from a confidence that such money will generally be accepted in exchange for goods and services or redeem any obligation or debt. Ultimately the confidence has to be in the honesty and integrity of the body that issues and controls the amount of money in circulation. George does not ignore the fact that such power has been abused in times past as monarchs and governments have sought to enrich their exchequers by such practices as clipping and debasing their nation’s currency. Rather he regards the transparent risks involved in governmental abuse, where they have direct responsibility for the issue of currency, to be less than those that attend the more obscure regulation of private individuals and groups, who are granted such a privilege. George considered it wrong and dangerous to permit individuals and associations (i.e. private banks with a pecuniary interest) to issue money. He argued that doing so had a corrupting influence on government (due to the need for regulation) and occasioned a substantial financial loss to the general population. No doubt recent events concerning the regulation of banks and financial institutions by government agencies would have reinforced his concerns and provides much evidence to support this view. George concluded that the issue of money and the control of its supply is the exclusive business of Government. The legitimate business of banking is limited to the safe-keeping and loaning of money, and the making and exchange of credits. Under current arrangements it would seem to be impossible to distinguish between Bank created money based on debt and money issued directly by government. They merge as one. If George’s idea of government issued money (legal tender) being strictly and directly under the control of government were to be implemented, a clear separation would be required. It is not too difficult to envisage a situation where bank-created tokens of credit denominated in money units could be exchanged for legal tender at something other than a one for one basis. Most of us are already familiar with a working model—the daily use of both debit and credit cards and their associated accounts. One could envisage a situation where all payments to and from the government would only be permitted in government issued money (plastic, digital and paper) and how all this money would be registered just as bank notes already have an ID code attached. They could also have a limited life to ensure their circulation rather than storage. Maybe the nation would not need all that much of this money to do its primary job. The value of the bank notes in circulation at present is, according to the Bank of England, around £50 billion. If, as seems likely, each note could be used at least twelve times a year i.e. 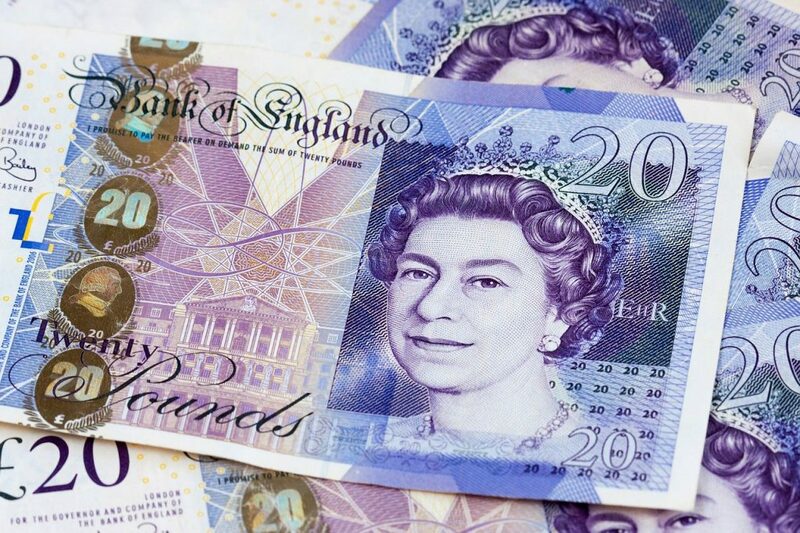 compatible with the normal monthly interval between payments of salaries and accounts this would enable 50 x 12 = £600 billion worth of trade to be carried out using these notes. Since this represents around a third of the current GDP, would a mere tripling of government issued money, which currently represents between 2% and 3% of the broad money supply, be sufficient to enable all genuine trade to be carried out? Would we then see more clearly what the remaining 90% plus money has been created for?